when it comes to fitness every one focusing on arms,chest,legs bust the most important part of our body is core abs and obliques .the more strong obliques you have more inner strength you will posses. here will tell you about How to develop strong Obliques. thus to develop strong lean body you have to make strong efforts on your core and obliques. Thus there are ample of exercise with and without loads and you can focus on your obliques with different angles. obliques are the best part of our body and one must pay attention to obliques exercise for better spine stability.here are few best exercise for obliques. Lie on one side with your legs straight and prop up your upper body on your forearm. Raise your hips so your body forms a straight line from your head to your heels,now you can feel pressure on your obliques .more pressure more pain you resist more result you will get.try to do 5 raps of 10 sets . Face your face to wall .hold your body on your arm with straight back and try to pull one leg and one arm upwards and then drag down .do this activity for at least 3 mints and you will see the pressure on your obliques .for better results you ca increase the time limit according to your endurance. Sit on the floor with your knees bent. Hold a weight plate straight out in front of your chest and lean back so your torso is at a 45-degree angle to the floor. Brace your core as if you’re about to be punched in the gut.without moving your hip rotate your plates and stabilize your core for better result. Best exercise for obliques ,band resisted anti rotational press. 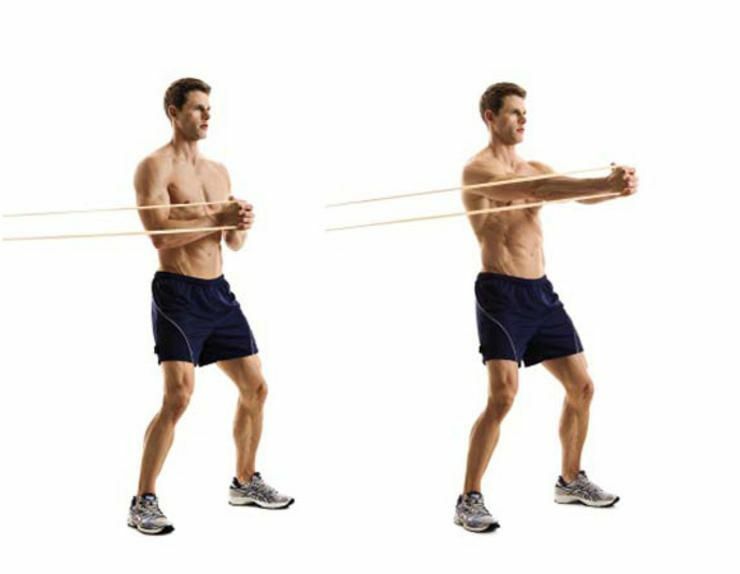 just grab the band with both the hands and pull from one side ad make an angle ,Pull the band in front of you so it’s even with the middle of your chest. Holding it with both hands, take a step or two away from the post to create more tension in the band. Get into a push up position. Raise your right knee toward your left elbow, lower, and then raise your left knee toward your right elbow. Begin slowly to practice and then try to move as quickly as you can.now repeat this activity from another side . try to do 5 raps of 10 sets. These are the best oblique exercise for your body, you can perform it by using and weights or without weights.